PORTOLA, Calif. - Even if the Western Pacific Railroad isn't familiar to you, you know its rich heritage in the California Zephyr. 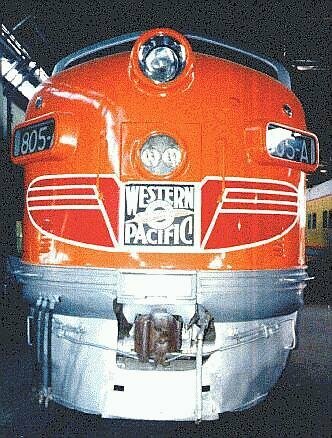 Operated daily with the Denver & Rio Grande and Chicago, Burlington & Quincy railroads between Oakland and Chicago, it pioneered those nifty domed passenger cars in the late Forties and followed a route across the Sierras, Rockies and Plains arguably one of the most beautiful stretches of scenery in the world. The Zephyr made its last run in 1970. The Western Pacific's jewel in this triple crown was the Feather River Route, 115 miles of crashing waters, sheer gorges, incredible bridges and tunnels that mark the canyon. Getting to the Portola Railroad Museum is a sightseer's windfall, whether taking Highway 70 through the Feather River Canyon east out of Oroville; making the easy 50 miles north from Reno on Highway 395 and then west on Highway 70; or going north from Truckee (at I-80) on Highway 89 through forests and valleys of ranches and farms so picturesque you expect to see the Cartrights galloping toward you at every turn. The museum isn't for sandals and white slacks. It's an old train workshop donated by the Union Pacific Railroad to help the Feather River Rail Society preserve the heritage of the Western Pacific and railroading in general; in the early Eighties, UP bought up the financially ailing WP and took over its tracks across the Sierras. The museum began in 1983, and UP donated the first engine shortly thereafter and has been a benefactor ever since . . . most recently donating a million-pound, 6,000-horsepower diesel called a Centennial to the cause. Society volunteers operate the museum as a hands-on place of reverence for the railroads that united the states; the WP's rails over the rugged Sierras played a key part during the first half of the century helping California's economic boom, and the beauty of its route made passenger train travel a genuine American adventure before air travel flew into town in the late Fifties and turned passenger trains into a government stepchild. The volunteers believe railroading should be enjoyed. Not only did they offer the first drive-a-train program in 1990, but admission to the museum is by donation ($2 per person). Unlike ``Hmmm, that's interesting'' museums, this one is visitor-friendly. You're encouraged to roam its 39 acres, climb on just about anything and ride the trains that operate on weekends. The museum's gift store has some of the neatest railroad memorabilia, mugs, pictures, T-shirts and more - and their prices are the best around. A traveling version of the gift store is at most area train shows. For model railroaders, a large HO layout is under construction, and one of the volunteers paints railroad art that's savant dynamic. Touring the yard, climbing ladders, peering into sun-bleached windows of cars not yet restored, or just trying to imagine what some of the unfathomable equipment is that kept the railroads running for a century is an experience even for the non-railfan. Trains trigger memories in all of us . . . and have been popular with filmmakers from the silent movies to today, which is why Sylvester Stallone was at Portola not long ago taking diesel lessons from the society's instructing engineer Skip Englert; the actor is reportedly preparing for a movie involving trains and wanted some hands-on experience. Driving the Feather River Canyon is an experience in itself, with two spectacular railroad sights - the William's Loop and the Keddie Wye. The loop is like the famous Tehachi Loop and the Keddie Wye splits into two trestles high above the Feather River. Since the Feather River Route is used by Union Pacific, seeing trains muscling the grade is common, and Portola is a crew-change site so freight train activity during your visit to the museum is a bonus. For museum information, call (916) 832-4131. And you can see a lot of this action from Portola's The Pullman House Bed and Breakfast, 256 Commercial St. It has neat, clean rooms, good food, the rates are $55-85 a night, a deck overlooks the Union Pacific yards. For information, call (916) 6-832-0107. San Diego Railroad Museum, Campo, California. (619) 595-3030. Weekend steam and diesel excursions, special trains into Mexico. The North American Tourist Railroad and Railroad Museum List - Almost every railroad attraction in North America is listed here and linked. Absolute must visit. Information Train Station Guide to Tourist Railway - Links to tourist railroad websites from around the world. To find out more about the engineer program, visit "Get Ready to Rumble"